I consider myself much more of a road runner than a trail runner. For some reason I don’t take trail runs quite as seriously. The runner in me likes a standardized distance on a mostly standardized course. This doesn’t mean I’m not willing to do a nice downhill marathon, but the competitive part of me prefers a race that’s more straightforward than a typical trail run. That said, I understand why people like trail runs: often better scenery, more natural, challenging terrain, unique courses, etc. (Some people also argue that they are easier on the joints, although I’m not convinced.) I’ve done a few trail runs, including the Foothills 50K Frenzy and XC12K a few times, but less than 10% of my races have been on trails. Last year I signed up for a crazy race called the Wilson Creek Frozen 50K. It was to take place right in the middle of my Boston Marathon training, so I’d be prepared for 50K. Unfortunately the Treasure Valley’s 2017 Snowpocalypse happened. Despite repeated attempts to keep the trails groomed, the 2017 Wilson Creek race had to be cancelled. I wasn’t quite as excited to run it this year, but I figured I’d use my 60% discount/refund. 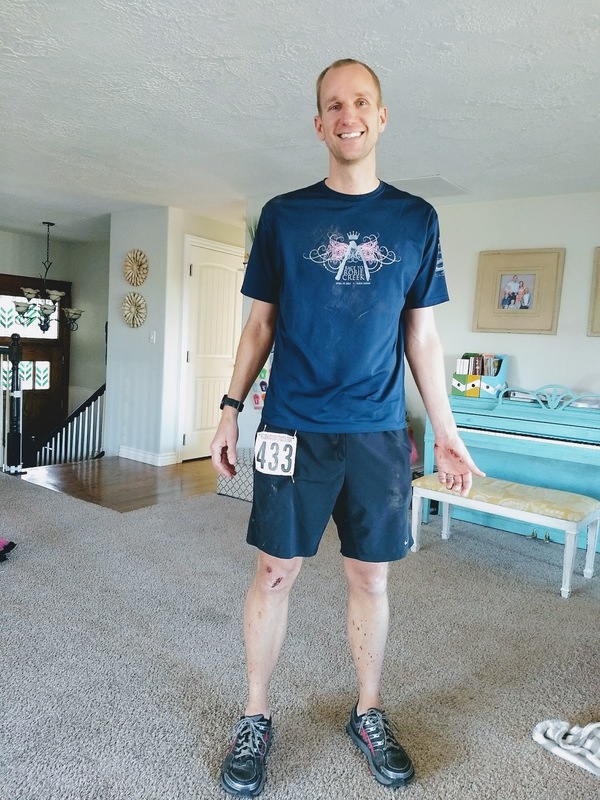 I didn’t feel like recovering from a 50K and I wanted to focus on speed a bit more this spring, so I signed up for the 20 miler rather than the 50K. This year the winter has been much more mild. I drove the 45 minutes to the trailhead to find no snow, soft dirt, and 40 degree temperatures. The weather was essentially perfect for a mid-January run. I had done a micro-taper for the race, taking it a little easier than normal during the week, but I wasn’t trying to break records or anything. I viewed this race as a tough training run with some competition to make me push extra hard. After getting my bib and standing by the fire for a bit, we lined up for the 7:30am start time. The 50Kers and 20 Milers all started together — the 50K course used the 20 mile loop as the first 20 miles of their race. To start the race a guy shot a shotgun, which was a nice touch. Many people had headlamps, but I figured there was enough light that I’d be ok without a flashlight (I was barely right and was grateful that there were some other lights around me). I also stupidly didn’t bring a water bottle even though I knew there were only two aid stations — one at 3 miles and one at 12 miles. 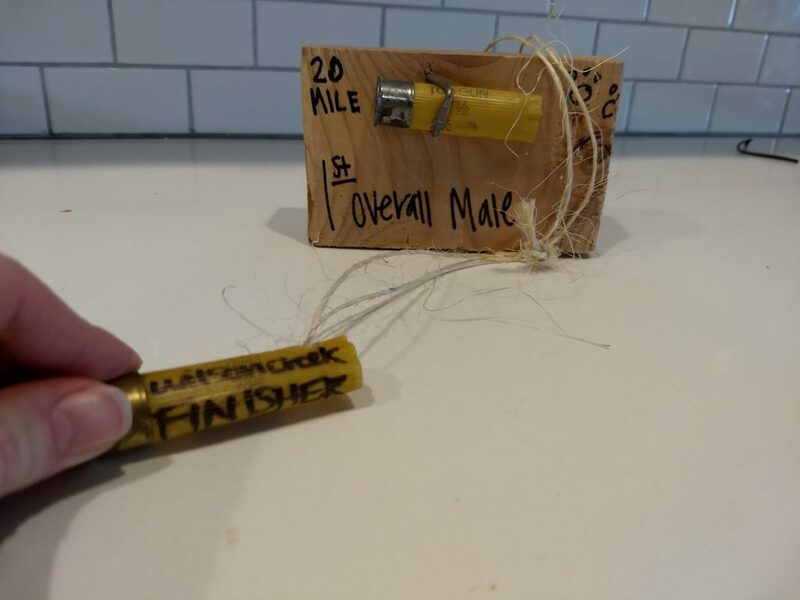 It’s only 20 miles, right? Wrong. It was 20 miles with 4900 feet elevation gain and loss. In the summer I generally work more hills into my training, but I hadn’t ran a decent hill since the week after Zeitgeist in early November. I quickly realized I was a little under-prepared for that aspect of the course. The first couple miles were fairly tame with some single track. I started off pretty easy and worked my way up to second place. I got a drink at the aid station at 2.5 miles. Then the hills started. The next mile was about a 13% grade. Knowing that I had 16 miles ahead of me still, I conceded that walking up this grade was ok. In fact, I walked quite a bit between mile 2.5 and 7.4 (the top). The average grade is about 10%, but that includes some blistering downhill portions. I alternated between walking/scrambling up steep hills and trying to maintain control on some 100-200 foot declines. We were on a rough dirt road. I found that I was sweating way more than expected due to the tough hills and unseasonably warm weather. This concerned me a bit as I knew there was a long way to the next aid station. The scenery was pretty nice. It was high desert type scenery — some sage, cheat grass, and lava rock cliffs. Finally I reached the summit and also had an opportunity to see that I was 3-4 minutes behind the leader. The summit has a radio tower and is a short out-and-back. I grabbed a plastic snake from a bag at the tower and dropped it off after the “back” portion to a guy on a 4-wheeler to prove I made it to the top. Luckily he had a water bottle he said I could take. He actually had a jug of water, but no cups, so he just told me to take the bottle he had. That was perfect and I was very grateful for it. The next 5.5 miles of the course was almost entirely downhill. It had rained a couple days before so the ground was soft without being too muddy. The leader was long gone so I was hoping for second at this point, maybe first if I got lucky. After a long trip down I found the aid station and was happy to grab some snacks and refill my water bottle. I was about to get back on the dirt road when one of the volunteers pointed me to the weeds. Seriously, we were supposedly on a trail but I could hardly see a trail. It was weeds. And it was straight up again — about a 700 foot gain over the next 1.5 miles. As I made my way up the “trail” I was astounded to be scrambling through weeds that were sometimes as high as my shoulders (and I’m 6’4″). The people that marked the trail did a fantastic job and I typically just looked for the next pink tape and went straight for it as there wasn’t much of a trail to follow. I finally made it to the ridge and was happy to find another dirt road near the top to follow down. It was a very rocky road, but since it was also pretty steep I was moving down it pretty fast. My mind was wandering a bit and I was thinking about Waterloo (I was in the middle of reading the book, Waterloo), when suddenly my right foot caught a rock. I let out a yell as I did a superman pose right into the dirt. I laid there among the rocks and dirt for a second before hopping up. I was very thankful I didn’t have any serious injuries, but I certainly had some scrapes from my knee to my waist to my chest to my shoulder and out to my hand. Ugh. That was the worst fall I’ve ever taken while running as far as I can remember. There was only one thing to do, so I plodded on. At about 17 miles I turned off the road onto single track again and headed up a steep 250 foot climb. While going up I caught a glimpse of a runner behind me, which gave me some impetus to keep working. I was getting worn out by now and looking forward to the end. The plateau on top of the hill was a scenic area and I enjoyed running through it. Then there was a steep downhill on single track before a final stretch to the end. As usual, it was very refreshing to finish up and get some food and water in me. 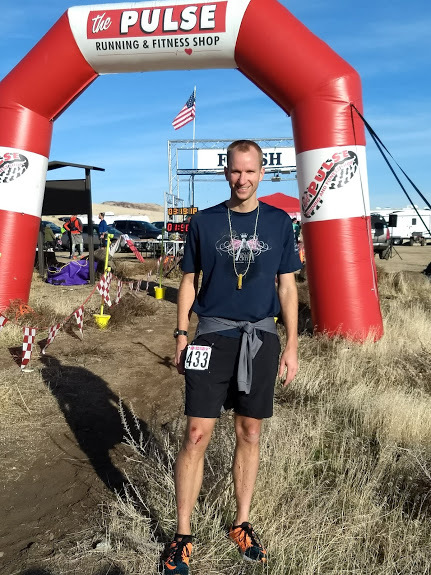 While I ended up being the first finisher in the 20 Miler, it didn’t feel that way since the runner ahead of me and behind me were both doing the 50K. 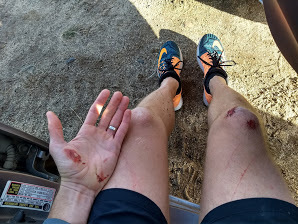 I was very happy I wasn’t doing the 50K since I was feeling pretty beat up. Cyndi snapped a photo of me when I limped into the house. The “medal” was a little hokey but very Idaho. Same with the award for first place.